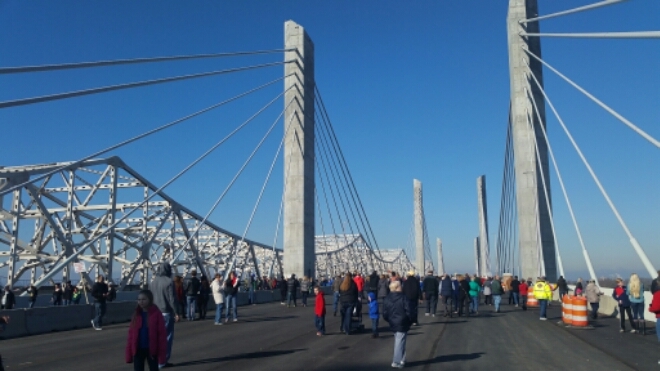 The city of Jeffersonville, IN offered the public a walking tour across the new Abraham Lincoln Bridge this past weekend before it opened to traffic. We waited until noon which was a good time to let the fog lift and allow the sun to warm up a little. My hand warmers were still activated from my 5 mile run that morning. The only drawback to going later was missing the commemorative medals to the first 10 thousand walkers. 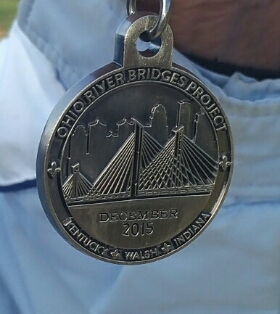 Commemorative Medal from a lady who was leaving as we arrived. According to news sources, there were close to 50 thousand people who came out for this historical event. I can’t blame them. There’s just something about once in a life time opportunities. 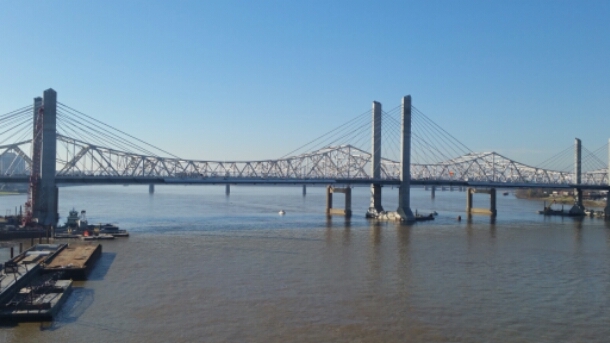 The traffic was so thick with the Cardinal’s game that we had to park at the waterfront and walk to Indiana from the Big Four Bridge. 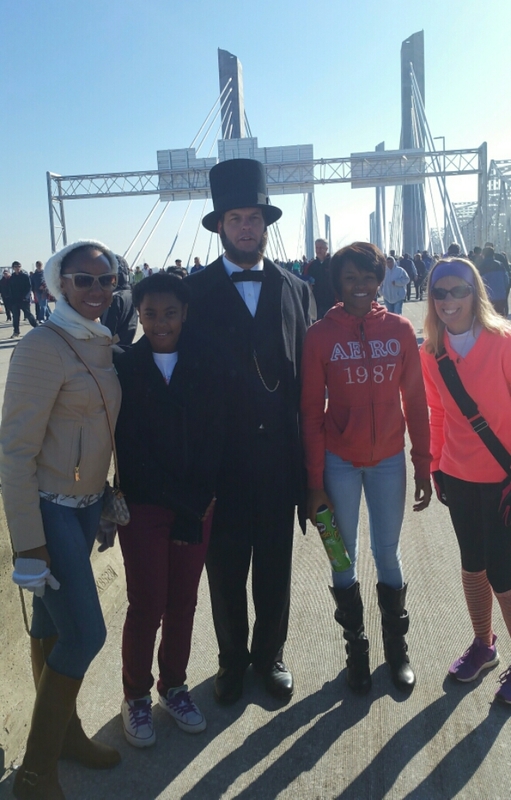 We cut across the park area towards the ramp and walked back towards Kentucky on the Lincoln Bridge. Leave it to my friend Karen to GPS the distance. Truth is, I would have done the same had I remembered my Garmin. 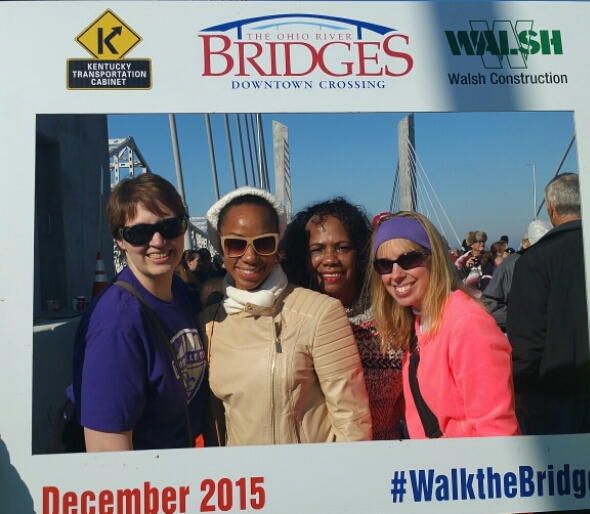 We took photos along the way and waved at northbound drivers across the Kennedy Bridge. The Kennedy Bridge opened 52 year earlier around the same day. The trek towards the end was exactly 3/4 of a mile including the ramp. We made our way back to Indiana and still had to walk back to Kentucky on the Big Four. In total, it was about 3 miles in the cold but totally worth it, and something we can speak on years from now. 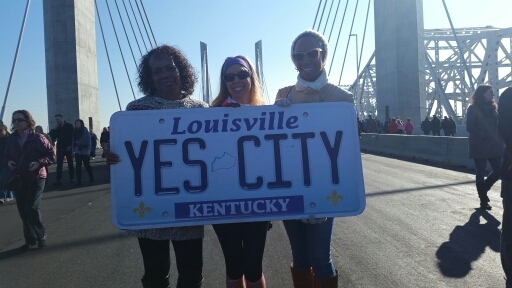 This entry was posted in family, fitness, Indiana, Louisville. Bookmark the permalink. This was so much fun. Thank you for the invite. I had an absolute blast. And it is always great fun to hang out with you. Ayyyyyyye! Yung Bezy So Sick. Good to hear from you!